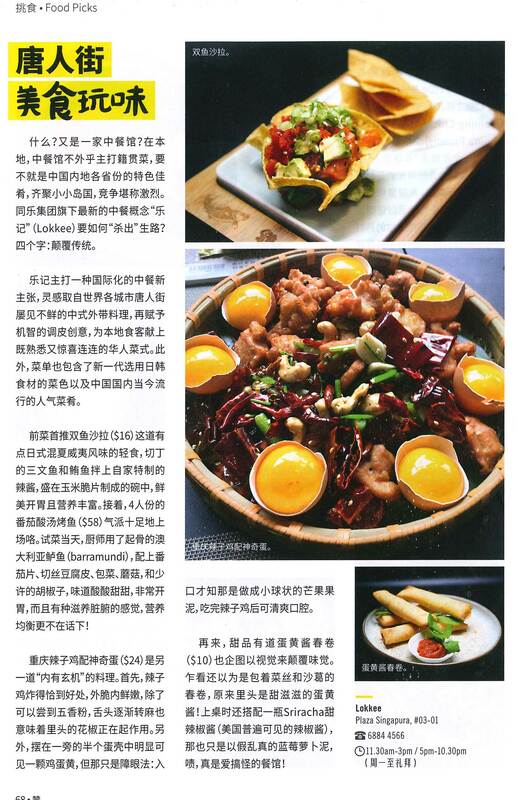 Lokkee, located at Plaza Singapura, is TungLok Group’s latest F&B venture offering global Chinese cuisine. The restaurant is a witty and cheeky play on favourite Chinese recipes which have been given a unique tweak to include a dash of Western influence. This genre of Chinese cuisine, often defined by chow mein and fortune cookies, is reinterpreted and elevated at Lokkee through fresh, top quality ingredients and clean flavours. 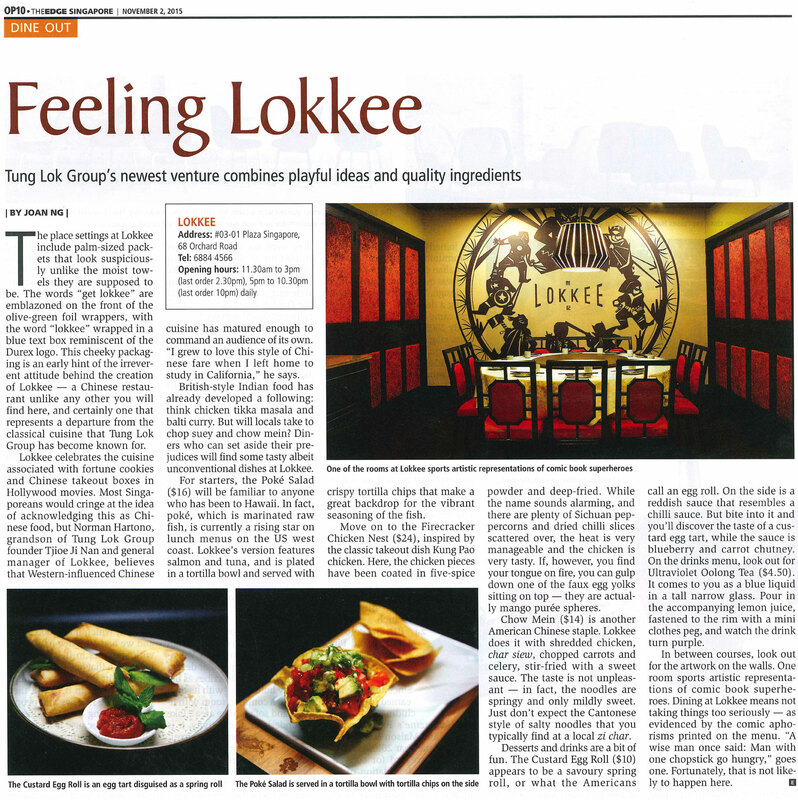 Conceptualised by Norman Hartono, Lokkee aims to add diversity to Singapore’s restaurant landscape and celebrates the style of cuisine commonly found in Chinatowns dotted across major cities such as Los Angeles, New York, London and Sydney. Deep-fried diced chicken served with chopped dried chillies and mango purée. What’s more awesome than gravy braised beef served in a pineapple? Braised beef served in a pineapple ON FIRE, that’s what. ‘Hor Fun’ flat rice noodles served with premium A4 grade Wagyu beef, crispy deep-fried ‘hor fun’ stripes, poached egg and finished with truffle gravy. Pan Seared egg noodles with king prawns, topped with a tomato seafood sauce. Fried butterflied shrimps with pumpkin butter cream served in a pastry bowl. Prawns and Chicken in a double boiled broth, simmered with Gosnells London Mead. Deep fried Durian with coconut flakes, popping candy and strawberry caviar. Bourbon whiskey with 5 spice infused bitters and a sugar cube, garnished with an orange slice. Pomegranate and oolong tea infused gin with a touch of citrus and fizz. Sweet, tangy and perfect for any time of the day. Gin, lemon and burnt rosemary. Fresh and cooling like a mojito. A perfect start to the night. Green tea infused light rum and hints of vanilla in this milky goodness. A classic mojito with light rum, mint leaves, sugar, muddled with fresh mandarin oranges.